Lying on the main Pennine watershed the top of Moudy Mea is situated less than a mile south from the summit of the A66 as it passes over the Stainmore Gap. While the northern boundary of the Yorkshire Dales National Park falls short of the A66 between Scotch Corner and Brough I have chosen the road as the boundary between the Yorkshire Dales and the North Pennines. 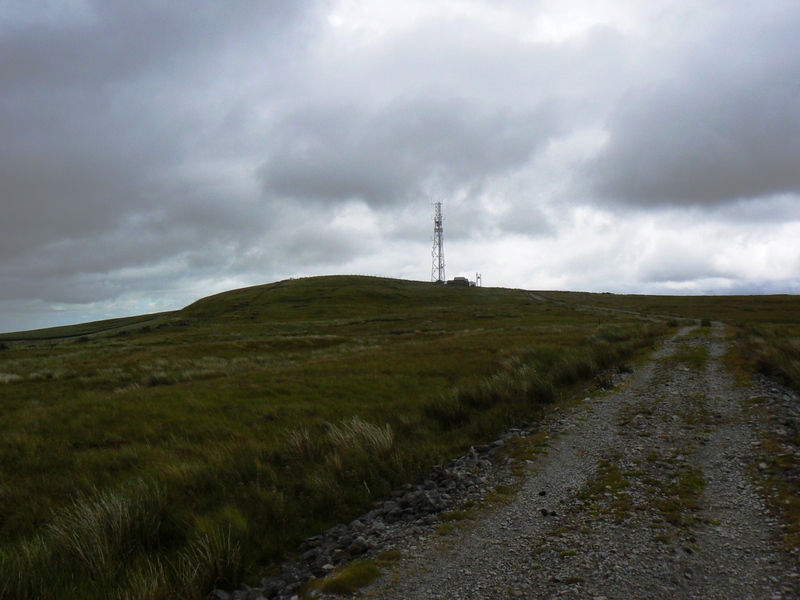 This makes Moudy Mea the most northerly summit in the Yorkshire Dales despite the fact that it falls within the North Pennines AONB and that unlike its near neighbour High Greygrits the fell was historically part of Westmorland rather than the North Riding of Yorkshire. 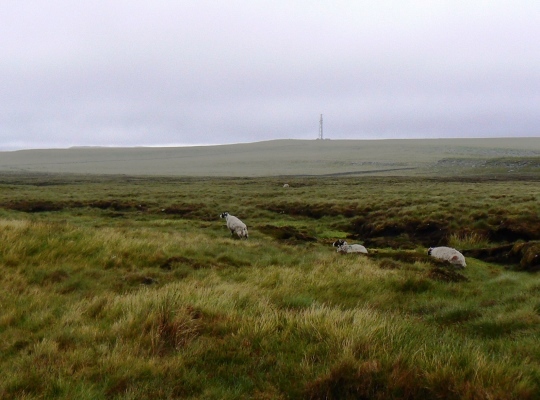 The summit of the hill stands less than a mile and only 100m higher than the summit of the A66. 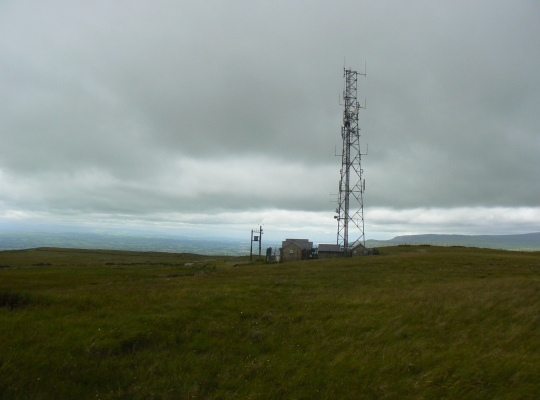 The radio transmitter near the top of Moudy Mea is a familiar sight to those who regularly use the A66. Moudy Mea is therefore seen by hundreds, if not thousands, of motorists every day though only a tiny fraction of them would know the name of the hill and probably even fewer have visited it. At first glance of the map it would seem that apart from the radio transmitter there is very little of interest to entice anyone but the most committed peak baggers on to its summit. In truth the summit is not a particularly interesting place. To those who are familiar with the peaty moors of Nine Standards Rigg to the south and the soggy moors to the north of the A66 the grassy top of Moudy Mea will come as something of a surprise. Personally I was also surprised at the quantity of cuckoo spit that was to be found in the grass. 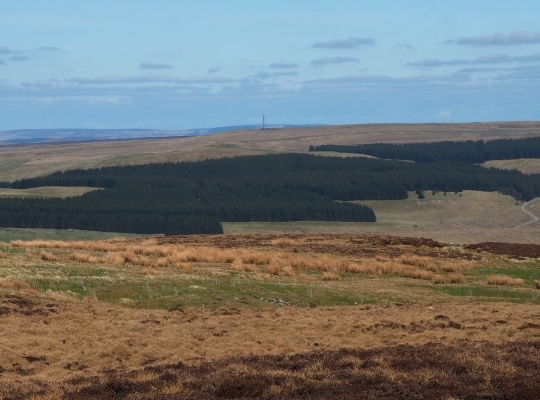 While the summit is cairnless and is fairly flat there are some reasonably good views north to the Mickle Fell region of the North Pennines and west across the Eden Valley to the Lake District. Despite its lack of obvious appeal the fell is of a geographical importance while there are sites of historical and geological importance too. 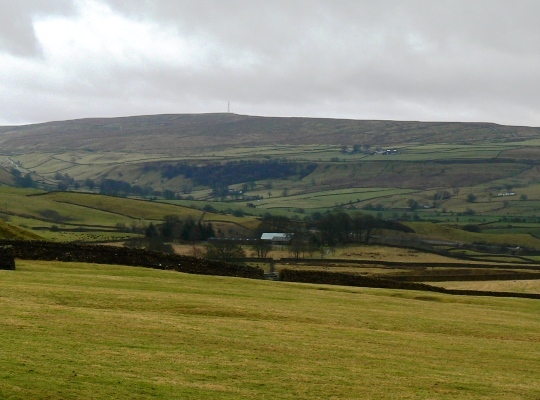 Geographically Moudy Mea sits on the main Pennine watershed. 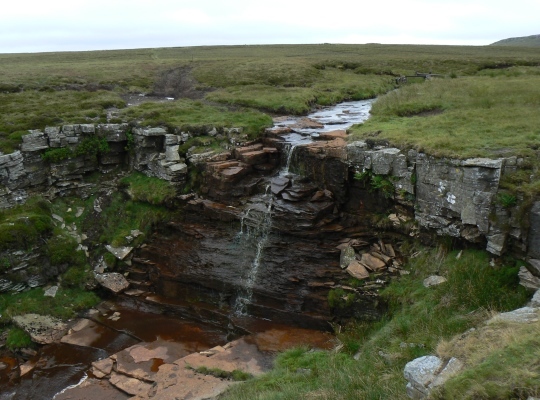 The water that flows off the north eastern and eastern slopes ultimately finds its way into the North Sea via the River Greta and the then the River Tees. The most substantial stream leaving the fell in this direction is Aygill which also features the attractive waterfall Aygill Force. To the west the water that leaves the fell is eventually gathered by the River Eden before finding its way into the Solway Firth. Situated roughly halfway between the summit and Aygill Force is the so-called Roper Castle, the site of a former Roman signal station. I am not 100% sure I identified the correct location on my visit but if I was correct then all that is visible is a slightly raised area of reeds roughly rectangular in shape. It formed part of a chain of signal stations that roughly followed the course of the modern A66. 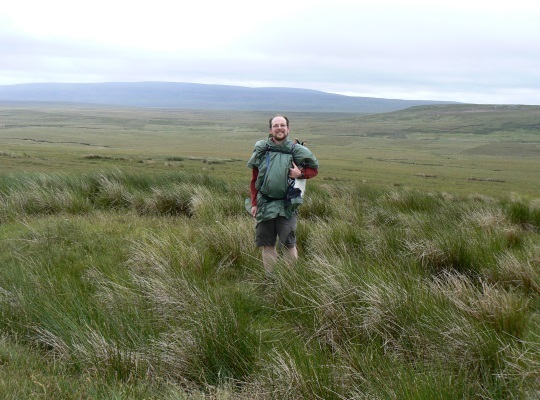 I think a spell on Hadrian’s Wall would seem like luxury compared to manning a signal station in this remote wilderness. Historically Moudy Mea has also been, like its neighbour High Greygrits, the site of some fairly modest quarrying activity. On my OS map all the quarries are marked as disused. On my visit though there was obviously modern machinery at Mousegill Bridge Quarry. On subsequent investigation on the internet I discovered that permission had been sought from Cumbria County Council to renew the extraction of gritstone from the quarry in 2006. Presumably the license was granted and the quarry is now operational again. Through the power of the internet I also discovered that the face of Moudy Mea was threatened with the proposal of a company called Community Windpower Ltd to construct a windfarm consisting of at least 12 x 125 metre (410 feet) wind turbines on the fell’s western slopes, just below the radio transmitter. The construction of such a wind farm in a designated AONB could have proven to be a dangerous precedent met with a lot of local opposition and seems to have been rejected.